Sabermetrics is the study of advanced baseball statistics. And who better to study that than Sport Management students? The student-led club formed during the Spring 2013 semester with Sport Management professor Dr. Rodney Paul as its faculty advisor. The club conducts in-depth discussions about baseball statistics and sabermetrics and members take part in a fantasy baseball league. Guest speakers are brought in on a variety of topics throughout the year, and the club takes part in a trip each semester. 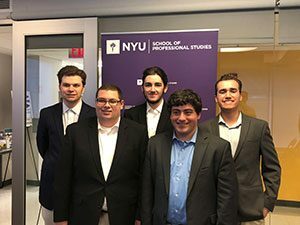 Syracuse University Sport Analytics majors (from left) Warren Schatten (’22), Kyle Liotta (’20), Drake Mills (’22), Joey Sabel (’20) and Daniel Precadio (’22) competed at the Fall 2018 SABR Diamond Dollars Case Competition at NYU. In November 2017, a team representing the Syracuse University Sport Management Baseball Statistics and Sabermetrics Club won the prestigious SABR Diamond Dollars Case Competition at NYU. 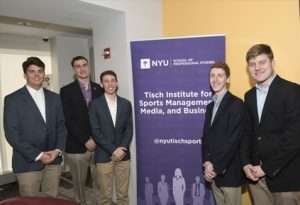 Sport Analytics majors Justin Perline (’19), CB Garrett (’19), Luke Scheetz (’21), Trevor Olofson (’21), and Zak Koeppel (’21) won the competition against other universities such as Villanova, NYU and Fordham. The teams were tasked with creating a model to determine a player’s BABIP (Batting Average on Balls In Play), both for hitters, as well as the BABIP that pitchers allow. They were then asked to use this to determine the players who are going to see the biggest increases and decreases in their BABIP next season. The teams were given five days to collect data, create a model, and prepare a 30-minute presentation on the topic to be given in New York City. Judges for the competition included Ben Jedlovec (Baseball Info Solutions), Chris Pang (New York Mets), Tom Tippett (consultant, formerly of the Boston Red Sox), and Cameron Barwick (MLB). The Club also competed in the competed at the Diamond Dollars event in Fall 2018, 2016 and 2015. Sport Analytics majors Luke Scheetz (’21), CB Garrett (’19), Zak Koeppel (’21), Justin Perline (’19), and Trevor Olofson (’21) (from left) teamed to win the 2017 SABR Diamond Dollars Case Competition at NYU. Each spring, members of the Sabermetrics Club participate in the Diamond Dollars Case Competition in Phoenix, Arizona, at the annual Society of American Baseball Research Analytics Conference. The students attend various panels, discussions and Spring Training games. As part of the 2018 competition, students were tasked to find the optimal launch angle for four different Major League players. As part of the 2017 competition, the SU representatives were tasked with researching “pitch tunneling” and presented their findings in front of representatives from multiple MLB teams. In spring 2014, the Club saw its research published in ESPN The Magazine. Dr. Paul and SPM students Matt Filippi ’15, Greg Ackerman ’15, and Zack Albright ’15 also co-authored a research paper that was presented at the 2014 MIT Sloan Sports Analytics Conference in Boston. Their paper, “The Effects of Atmospheric Conditions on Pitchers,” studied the impact of air density on pitch selection and pitcher performance. It was one of 16 papers selected from more than 300 submissions worldwide. For more information on the Sabermetrics Club, contact club president Justin Perline at jtperlin@syr.edu or club advisor Dr. Rodney Paul at rpaul01@syr.edu. Club officers are CB Garrett, Vice President; Seth Kourpas, Treasurer; Evan Weiss, Director of Research; Sam Marteka, Director of Social Media; and Luke Scheetz, Director of Outreach. The club meets weekly during the academic year on Wednesdays at 6:45 p.m. in Falk 200. The club is open to any SU student. Check out the video by NCC (Newhouse Communications Center) News featuring the SPM Sabermetrics club on how Sabermetrics club brings passion for baseball statistics to SU. Interested in basketball and/or analytics? From NBA to college hoops, we study it all! The Sport Management Basketball Analytics Club is in its third year of operation and always looking to expand its membership while uncovering fascinating statistics in basketball. The organization was assembled to conduct analysis on the NBA, NCAA basketball, and high school basketball. The club has expedited the process of recording large sums of data at an efficient pace. This has led to more thorough research as well as additional projects. The club has analyzed “The Effects of a Max Contract on an NBA Player’s Performance,” and “The Best and Worst Tandems (High Profile) in the NBA.” The club aims to gather a group of students who share the same zest for basketball, in addition to their drive for research. Members practice their analytical skills in Excel as well as utilize their research skills on basketball databases to find appropriate data for analysis. A future goal of the club is to construct research that can be presented at basketball analytical conferences. 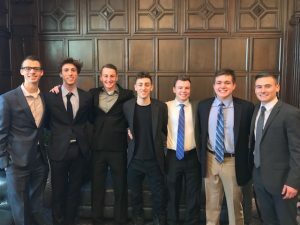 In February 2019, Club members Jonathan Bosch, Nick Riccardi, Zach Anhalt, Alejandro Pesantez, Fletcher Wilson, Isaiah Freedman, and John Litchenstein attended the McCormack Sport Analytics Trade Deadline conference at UMass. They acted as GMs in a simulation of the NBA trade deadline. Attendees were broken into groups and assigned an NBA franchise. The groups then began trading and transforming their rosters for the duration of the day. The event gave students the opportunity to practice first-hand what takes place during NBA trade negotiations in regard to trade rules, salary cap management, and the CBA, among others. The club meets 7 p.m. Tuesdays in Falk College Room 104. All are welcome! Come and learn about the next wave of the sports industry. Contact Sport Analytics major Jonathan Bosch at jbosch@syr.edu or SPM associate professor Dr. Shane Sanders at sdsander@syr.edu for more information. The Sport Management Football Analytics Club was established in September 2017 and inspired by the popularity of the SPM Baseball Statistics and Sabermetrics Club as well as the first class of Sport Analytics majors. Over the past year, the club worked on a research project, interacted with guest speakers, and talked football. The topic of the club’s research project is, “How player arrests affect team winning percentage in the NFL.” The club looked at every player arrest from 2000 to present using an online database and recorded the player’s team and year(s) they were arrested. Also included in the research is each players’ on-field value since a non-starter being arrested would not have the same effect on the team as a star player being arrested. The club welcomed guest speakers Tucker Zeleny, director of sports analytics at the University of Nebraska; JT Busco, Syracuse University football assistant coach; and Ryan Smith, analyst and account manager at Pro Football Focus. The speakers gave students insight into the use of analytics in both professional and college football. Club officers are Zachary Koeppel, president; Gareth Jobling, vice president; Dylan Blechner, director of research; and Harry Platt, director of operations. The Football Analytics Club meets at 6 p.m. Mondays during the academic year in Falk 104. All Syracuse University students are welcome to attend. The club will recap its projects from last year, introduce new members, and work on new projects. Bring your friends who are interested in analytics, or just football in general. All are welcome! For more information, email Zachary Koeppel at zkoeppel@syr.edu. The Sport Management Sales Club was established in September 2015 to act as a medium for earning members hands-on experience in the sport sales industry. In a job market with increasing demands for preliminary experience, students can add practical sales experience under their belts and, in turn, onto their resumes. All SU students are invited to attend. Since its establishment, the club has formed a relationship with SU Athletics. 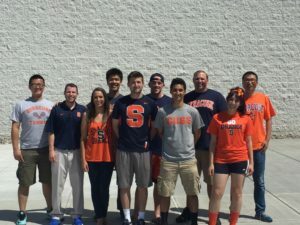 Members underwent sales training in preparation for the Fall of 2016, in which the club was invited to join the SU Athletics sales staff selling tickets to SU football, women’s basketball, and men’s basketball games. Members of the Club continue to work with SU Athletics today. 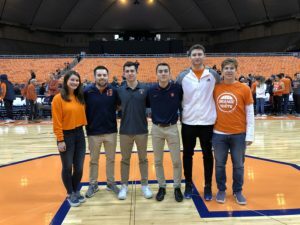 One of the many highlights of the Sales Club’s success was helping to break the all-time women’s basketball attendance record for a single game when the SU women played Notre Dame on February 19, 2017 at the Carrier Dome. Members are looking to broaden their knowledge by continuing to grow in size, and also to work outside of Syracuse athletics. 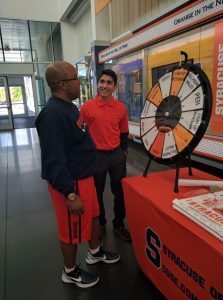 The club also received live sales experience by selling football season tickets at SU’s “Select-a-Seat” events. In April 2018, the SPM Sales Club worked with the Syracuse Crunch to put on an “SU Night” for the Crunch’s game against the Utica Comets. A portion of the proceeds benefited the Boys & Girls Club of Syracuse. 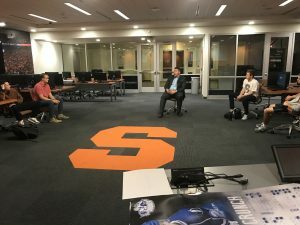 Guest speakers Adam Vogel, of the New York Mets, and Mark Hayes, of the Syracuse Crunch, met with the club during the 2017-18 academic year to lend their knowledge and experience. Under the direction of SPM instructor Pat Ryan, club members look to build on existing connections with professional sport organizations as well as network with industry professionals. In Summer 2018, members of the Sales Club interned with the New York Yankees, New York Mets, Madison Square Garden, Boston Red Sox, and USA Track & Field, among others. Club officers for 2018-19 are Connor Monzo, president; Seth Kourpas, vice president and director of programming; Sam Marteka, director of community service and event chair; Drew Bush, director of membership; and Jacob Apostol, vice president of administration. For more information, contact Connor Monzo at cdmonzo@syr.edu, or Pat Ryan at paryan@syr.edu. The Sport Management Sales Club meets at 6:30 p.m. Thursdays during the academic year in Falk 400. All Syracuse University students are welcome to attend. 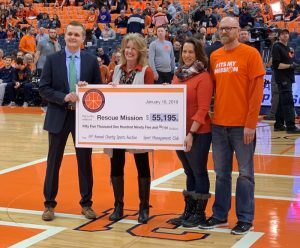 SPM Club vice president Connor Monzo (left) and longtime SPM Club co-advisor Kate Veley (second from left) present a check for $55,195 to representatives from the Syracuse Rescue Mission on Jan. 18 at the Carrier Dome. The Sport Management Club is a student-run organization of the David B. Falk College of Sport and Human Dynamics’s Department of Sport Management. Since its founding in 2005, the Club has raised over a quarter of a million dollars for local charities. Beneficiaries of the Club’s annual charity auction have included the Meals on Wheels of Syracuse, Boys & Girls Clubs, American Diabetes Association, Golisano Children’s Hospital at Upstate, the Ronald McDonald House Charities of CNY, the Central New York SPCA, the Upstate Cancer Center, Special Olympics New York, Food Bank of CNY, McMahon/Ryan Child Advocacy Center, and the Salvation Army. The Club’s signature event is its annual Charity Sports Auction to raise money for a Syracuse-area charity. 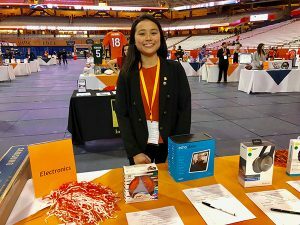 The 14th annual auction was held on December 1, 2018, during the SU men’s basketball game at the Carrier Dome. To support the Syracuse Rescue Mission, supporters placed bids on hundreds of items, including sports memorabilia, gift certificates, household items, vacation packages, electronics and tickets to major sporting events. In conjunction with the live event, Steiner Sports also hosted an online auction, which showcased a number of premium items up for bid. Final totals will be announced later this month. The 2017 auction raised $56,800 for Meals on Wheels of Syracuse, the 2016 auction raised $42,900 for The McMahon/Ryan Child Advocacy Center in Syracuse and in 2015, the Club raised $40,470 for the Salvation Army. Find out more about the annual Charity Auction. During the academic year, the Club is also involved in many on-campus and off-campus activities in addition to the Charity Auction. The Sport Management Club meets at 7 p.m. Tuesdays during the academic year in Falk 200. Students from all majors are welcome. For more information, contact SPM Club President Sam Marteka (svmartek@syr.edu), Executive Vice President Connor Monzo (cdmonzo@syr.edu), Vice President of Community Service Steven Soriano (sjsorian@syr.edu), Vice President of Programming Jonah Wheeler (twheel01@syr.edu), Vice President of Membership Kaitlynn Miller (kmille16@syr.edu), or Vice President of Administration Andrew Bush (anbush@syr.edu). SPM director Michael Veley serves as the Club’s advisor. 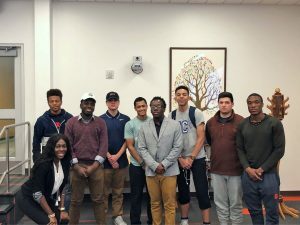 The Sport Management Sport Professionals of Color Club wrapped up its fourth year in 2017-18, as a vehicle to connect students who identify as people of color with sport professionals from across the industry. The organization was formed during the 2014-15 academic year with the purpose of helping to guide young professionals in their pursuit of success and career establishment in the sport industry. The club strives to sharpen members’ professional skills, host speakers, foster networking growth, and expose experiential opportunities to its members. Vera Jones (second from left) spoke to the Sport Professionals of Color Club in Fall 2016. She is shown with (from left) Dearbea Walker, Tawny Francis, and Morgan Telesford. 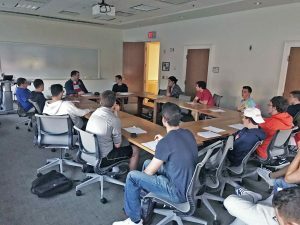 During the 2017-18 academic year, the club began a new membership drive under the leadership of president Ian Williams and held an NFL Draft watch party in Falk College. The club is planning to invite sport industry guest speakers in the upcoming academic year as well as plan outings. During the 2017-18 academic year, the club began a new membership drive and held an NFL Draft watch party in Falk College. The club is planning to invite sport industry guest speakers in the upcoming academic year as well as plan outings. During the 2015-16 academic year, club members co-hosted a panel discussion on women in sports titled “Competing to Win” with Phi Beta Sigma Fraternity, Inc., as well as hosted a Madison Square Garden internship panel. ESPN Information Specialist Francisco Ramos came to campus as a guest lecturer. The club has welcomed guest speakers Arnold Malloy of the Syracuse Chiefs, Kevin Cooper of the Houston Texans, and Davina Sutton of ESPN, CNN Atlanta/London, and Turner Sports. Meetings are on Mondays at 6:30 p.m. in Falk College Room 401, and are open to all Syracuse University students. Contact Nathan Gansworth at nrganswo@syr.edu for more information or call 315-443-9881. Mission statement: To provide students specific knowledge and experience focused on managing and operating sport and entertainment facilities and events. Create an experiential learning opportunity for SU graduate students interested in sport venue and event management. Create activities that foster philanthropic and social responsibility associated with sport. Create career networking and educational field trip opportunities for members of the organization. Executive Board: comprised of four (4) members. Advisor (Faculty Member): Provide oversight and managerial direction; serve as the liaison between the Department of Sport Management and The SVEM Club; work directly with officers on communication, marketing, and financial matters; serve as co-chair of fundraising activities sponsored by the organization. President: Represent the club as primary contact with the Office of Graduate Student Organizations. The President will be responsible for running all meetings, programming and developing club activities such as coordinating guest speakers, fundraiser meetings and other social activities. Vice President: Responsible for assisting the president in developing meetings and club activities, maintaining attendance of meetings, collecting membership dues, and other miscellaneous tasks. Treasurer: Responsible for keeping financial records of funds and allocation of disbursements subject to board approval, and as outlined by the Office of Graduate Student Organizations. Membership: Any graduate student in the M.S. Sport Venue and Event Management Program in the David B. Falk College of Sport and Human Dynamics at Syracuse University is eligible to be an active member and may hold office. All active members must submit annual dues of five ($5) dollars. Meetings: General club meetings will be held on a bi-weekly schedule, as determined by the President and Advisory Faculty Member and voted on by the membership. All general meetings are required among all members. Executive Board meetings will be held a minimum of once per month. For more information: Contact Dr. Jeffrey Pauline at 315-443-2630 or jspaulin@syr.edu. Women in Sports and Events (WISE) is a nationally recognized group whose goal is to be a leading voice and resource for women who currently work in, or aspire to be a part of, the professional field of sports and events. In 2009, Syracuse University was voted in as the first collegiate chapter of WISE’s national organization, and since its inception on campus, has offered multiple professional development opportunities for membership. Students in WISE are involved with numerous events and activities over the course of the academic year, including networking trips, fundraisers, interview workshops, professional development seminars, community service, and assisting with SPM alumni events on campus. 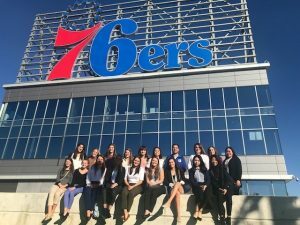 In Fall 2018, 20 club members traveled to Philadelphia, where they met with executives from the Phillies, Flyers, 76ers, and UPenn Athletics. They also attended a Flyers game. In Fall 2017, the club organized a two-day trip to Boston to network and learn from industry professionals at the Boston Celtics and at the Boston College Athletics Department. 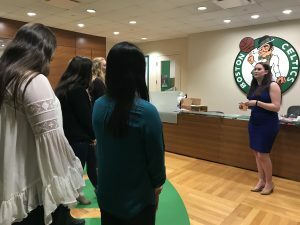 The women arrived to TD Arena on a Friday afternoon in February and were greeted by a panel of seven women – all WISE Boston members – that work in the front office for the Celtics. They then attended a game later that night. The next day, club members visited Boston College to meet with Blanchette, associate director of sports marketing, for a Q&A session and private tour of the athletic facilities. In April 2018, members worked with local company Urban Life Fitness to host a Spin-A-Thon to fundraise for future professional development trips and workshops. In Fall 2017, the group traveled to Colgate for a tour of its athletic facilities, attended espnW’s Campus Conversations hosted by SU Athletics, and collected monies for Trick-or-Treat for UNICEF. 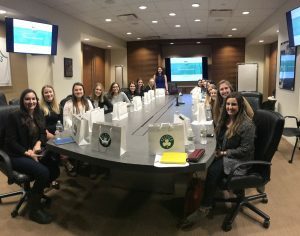 They co-hosted two professional development workshops: one focusing on salary negotiation with Dr. Mary Graham and Dr. Terry MacDonald, and the other on interview preparation, led by WISE co-advisor and Sport Management internship placement coordinator Nicole I. Cost. In February 2017, WISE hosted “Shoot for Success: WISE Women in Sports,” a pre-game panel discussion at the Carrier Dome. Organized in collaboration with Syracuse University Athletics, the panel discussion took place before the SU women’s basketball against Notre Dame. 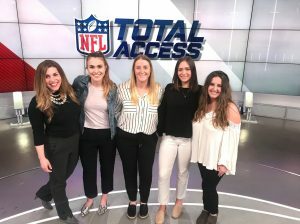 Designed for women interested in pursuing professional careers in sports and events, the event featured how-to guidance and personal experiences from panelists on leading a successful career in sports. Guest panelists included Boston Celtics Group Ticket Sales Manager, Chrissy Cronin; Boston Celtics Director of Marketing, Kara Hutchinson; ESPN Women’s College Basketball Analyst, Gail Goestenkors; ESPN Coordinating Producer, Kate Jackson; ESPN Play-by-Play Announcer, Pam Ward; and NCAA Director of Business Operations for Women’s Basketball, Tracie Hitz. Club officers are Kristen Rogers, president; Kaitlynn Miller, vice president; Elaine Johnson, vice president of recruitment; Caroline Johnson, vice president of internal programming; Danielle Parr, vice president of external programming; Hanna Kuo, treasurer; Devan Dachisen, director of social media; and Victoria Kelly, secretary. Keep up with SU’s WISE Club on Social Media: Twitter: @WISE_SU; Instagram: WISE_Cuse; and Facebook: Women in Sports and Events at Syracuse University, “@wisecuse”. WISE, which meets at 5:45 p.m. Tuesdays in Falk College Room 400, includes women from all majors on campus interested in pursuing careers in sports and events. For more information, contact WISE co-advisors Lisa Liparulo (lmliparu@syr.edu) or Nicole I. Cost at (nfimbrog@syr.edu). In February 2018, WISE members traveled to Boston, where they visited Boston Celtics headquarters. WISE members held “Shoot for Success: WISE Women in Sports,” a panel discussion on February 19, 2017 at the Carrier Dome. Guest panelists included (from left) Boston Celtics Director of Marketing Kara Hutchinson; Boston Celtics Group Ticket Sales Manager Chrissy Cronin; NCAA Director of Business Operations for Women’s Basketball Tracie Hitz; ESPN Coordinating Producer Kate Jackson; ESPN Play-by-Play Announcer Pam Ward; and ESPN Women’s College Basketball Analyst Gail Goestenkors.